Kudos to Fairmont music teacher Mrs. Marliyn Taylor. 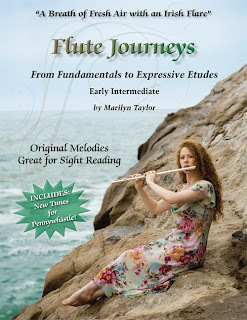 “After teaching flute for twenty years I decided to write a book to meet the needs of young flute students,” says Taylor and so she did! Flute Journeys includes fun, original tunes composed by Mrs. Taylor and is designed for young flute students--like her students at Fairmont. Mrs. Taylor teaches the woodwinds classes at Mable (5th-8th), Anaheim Hills(5th-8th) and Edgewood (5th & 6th) campuses. She also teaches the junior high orchestra class at Mable. You can purchase a copy online at www.newjtmusic.homestead.com or by contacting Mrs. Taylor at mtaylor@fairmontschools.com.